Most research within the field of physics focuses on predicting the future. But how rapidly does our knowledge of the past deteriorate? 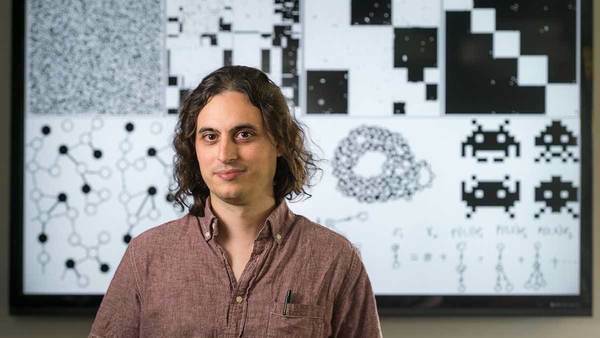 He and Notre Dame physics doctoral student Nathaniel Rupprecht defined “retrodiction entropy,” a quantity that measures the amount of information about the past states of the world as provided by measurements of a present state. In thermodynamics, entropy is a measure of how organized or disorganized energy is within a system of molecules. They explore retrodiction in their latest research, “Limits on Inferring the Past,” published Friday (June 29) in Physical Review E. “In this paper, we assume that we know something about how a random system may have started, and use data about what it looks like now to compute the entropy of the system moving backwards in time to its starting point,” said Rupprecht. They studied systems consisting of multiple particles within a potential energy landscape that also undergo random thermal motion. Examples of such systems include trapped gasses, astronomical bodies spreading in space, or droplets of ink dissolving in water. The researchers found a close a relationship between thermodynamic entropy and retrodiction entropy. Furthermore, they discovered that certain kinds of systems steadily degrade information, decreasing the chance over time that the initial state of the system can be inferred. Other systems, however, always retain memory of their initial state. Next, Vural and Rupprecht discovered that when a system is in a state of equilibrium, the ability to predict the future is the same as the ability to retrodict the past. But for an out-of-equilibrium state, the ability to predict and retrodict is always different. Rupprecht and Vural then investigated the relationship between a state of chaos and retrodiction. Chaos refers to a sensitive dependence of final states to initial states, popularly described as “the butterfly effect,” where a butterfly flapping its wings is said to have caused a storm a week later. Specifically, the researchers studied a simple model system called the logistic equation, which may or may not be chaotic depending on the value of one parameter. Using this equation allowed them to determine how retrodictable the system is when it is chaotic, and when it is not. Though Vural and Rupprecht were most concerned with the foundational questions they could answer with their research, their mathematical proofs may have wide-reaching applications. Originally published by Deanna Csomo McCool at science.nd.edu on June 29, 2018.